Diagnosed with a life-threatening condition at 20 weeks gestation, Xavier Sorying underwent an innovative operation while in utero that helped him overcome his birth defect. Xavier Sorying is a calm, smiley 7-month-old who seldom fusses and recently discovered his voice. His baby squeals and babble, and even his cries, delight his parents, Melissa and Ben Sorying. They also reassure the couple that despite a troubled start, their son is healthy. Before Xavier was born, his diaphragm — the muscle that separates the abdomen from the chest — developed a hole. As a result, his abdominal organs moved into his chest cavity, pushing aside his heart and restricting his lung development. Called congenital diaphragmatic hernia, or CDH, the rare condition affects roughly 1 in 2,000 infants. It put Xavier at risk for a slew of life-threatening complications, including underdeveloped lungs, pulmonary hypertension, gastrointestinal disorders and failure to thrive. "It was scary," Melissa says. "There was a lot of stress and crying." As devastated as Melissa and Ben were when they learned of their baby's diagnosis at Melissa's 20-week ultrasound, the couple, who live in Detroit Lakes, Minnesota, were given a glimmer of hope. Specialists in the Fetal Diagnostic and Intervention Center at Mayo Clinic’s Rochester campus were pioneering a treatment as part of a clinic trial that would allow Xavier's lungs to grow and develop, improve his chance of survival, and minimize future complications from his condition. 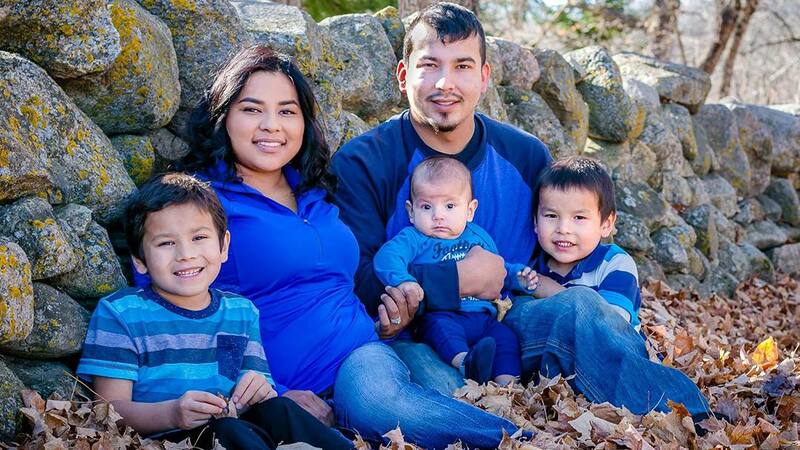 Two months later, Melissa and Xavier underwent a fetal surgery known as fetoscopic endoluminal tracheal occlusion, performed under the direction of Rodrigo Ruano, M.D., Ph.D., in Mayo Clinic's Department of Obstetrics and Gynecology. 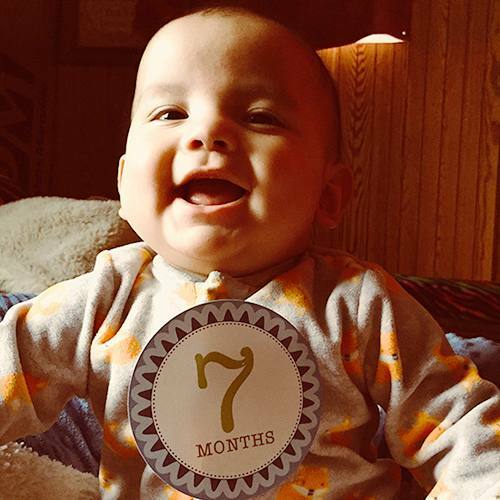 "It still blows my mind that he went through all of that so quickly, and here we are, seven months later, and he's growing and healthy," Melissa says. "You wouldn't even think that he had CDH until you see his scar. He's doing everything like a normal baby should." Children with congenital diaphragmatic hernia not only have a hole in an essential breathing structure, but their lungs and heart are compressed by the shifting of their abdominal organs, says Dr. Ruano, who is the director of the Fetal Diagnostic and Intervention Center. That often requires a high level of care, typically in a neonatal intensive care unit, or NICU. "The lungs are very small, so when the baby is born, they will have difficulty exchanging air," Dr. Ruano says. "The baby would need to be intubated and go to the NICU, and sometimes, depending on the severity of the defect, the lungs could be too small and the baby could die." When Melissa found out Xavier had a severe form of the condition, it was followed by the sobering news that many babies with the condition don't survive long after birth. "I was thinking, 'OK, so I'm going to carry this baby for nine months, and he's going to die right after I give birth to him,'" she says. "A couple of times before I was approved for the surgery, there were times I had to think about ending the pregnancy. I am so glad I was approved." "[Xavier] was bigger than we expected, which made his management more straightforward, and he was able to be repaired and even discharged earlier than term." — Denise Klinkner, M.D. Xavier is one of three babies in the Midwest who’ve received the innovative treatment at Mayo Clinic, according to Dr. Ruano, who has performed the procedure more than 80 times in the past 13 years at other national and international health care facilities. At Mayo Clinic, Food and Drug Administration and institutional approval are required before the procedure can be done. During the procedure, Xavier and Melissa, who was then 28 weeks pregnant, both received local anesthesia. Using ultrasound-guided imaging, a team of physicians, including Dr. Ruano and Denise Klinkner, M.D., in Pediatric Surgery, went in through Melissa's uterus and inserted a fetal endoscope through Xavier's mouth and into his trachea. In the trachea, a balloon was implanted and inflated. Once placed in Xavier's trachea, the balloon prevented fluids secreted by his lungs from escaping. The pressure then expanded Xavier's lungs and encouraged the growth of essential structures related to his lung function — such as aveoli, the tiny air sacs in the lungs where oxygen and carbon dioxide are exchanged. As a result, he would be born better equipped to breathe. Typically the balloon remains in place until the baby reaches 34 weeks gestation. During a second operation that's much like the first, surgeons remove the balloon from the baby’s trachea, which allows the child to take in air. However, Melissa's water broke at just 32 weeks, and she started having contractions while the balloon was still in her son's throat. That was a problem because it could put Xavier's breathing at risk. Before birth, a baby receives oxygen via the placental connection, says Dr. Klinkner. "Once the baby is born, the placenta wants to separate. But we needed to keep that connection intact until we could get the balloon popped. The balloon has to be popped before the baby can have his first breath." On the day of Xavier's birth, June 7, 2017, Melissa underwent a surgical procedure called an ex utero intrapartum treatment. It ensured that Xavier remained connected to Melissa's placenta until the balloon could be removed. "It takes great faith to go ahead with something like this," Dr. Klinkner says. "For her to have general anesthesia — she doesn't know how the baby did until she wakes up — that's an important piece." Despite being nearly two months premature, Xavier surprised his medical team. "He was bigger than we expected, which made his management more straightforward, and he was able to be repaired and even discharged earlier than term," Dr. Klinkner adds. About a week after Xavier's birth, Dr. Klinkner performed surgery to fix Xavier's herniated diaphragm. "We had to create a diaphragm for him," Dr. Klinkner says. "We essentially brought all of the contents back down into the abdomen and sewed a mesh patch into the remnant of the diaphragm." Xavier remained on oxygen support with a breathing tube in the NICU for another six weeks before he was weaned off of the oxygen. "The first time I heard him cry was when they finally took out the airway tube," Melissa says. "It was just a relief to know that he was able to stay breathing on his own, and that everything was going to be all right." Melissa adds that Xavier's 43-day stay in the NICU was significantly shorter than other babies with congenital diaphragmatic hernia. The fact that we collaborated and had such a great outcome points to what Mayo Clinic strives to do, which is to put the patient first." — Denise Klinkner, M.D. "He was blowing the doctors away with his progress," she says. "It was just amazing." That Xavier's recovery surpassed his medical team's expectations speaks to the importance of Mayo Clinic's team approach, says Dr. Klinkner. "I think the biggest point of this particular case is the fact that we work so well as a multidisciplinary team," she says. "It incorporated maternal-fetal medicine, as well as ENT, pediatric surgery, neonatologists, adult and pediatric anesthesiologists. The fact that we collaborated and had such a great outcome points to what Mayo Clinic strives to do, which is to put the patient first." Watch a video about treating congenital diaphragmatic hernia. Check out Mayo Clinic's Fetal Care Center.